In the words of Rajat N. Agrawal, MD, MS, the mission of Retina Global is “to find sustainable solutions to retinal disease management in underserved areas around the world.” Retina Global focuses on outreach programs in these underserved, often underdeveloped areas. The foundation is supported by participation from volunteer retina specialists from around the world who are trying to make a difference. For this article, I interviewed Dr. Agrawal about the work that Retina Global does. Ashvini K. Reddy, MD: Was there a specific experience that inspired you to develop Retina Global? Rajat N. Agrawal, MD, MS: I have worked in four countries around the world and have witnessed firsthand preventable blindness due to a regional absence of retina subspecialist providers. 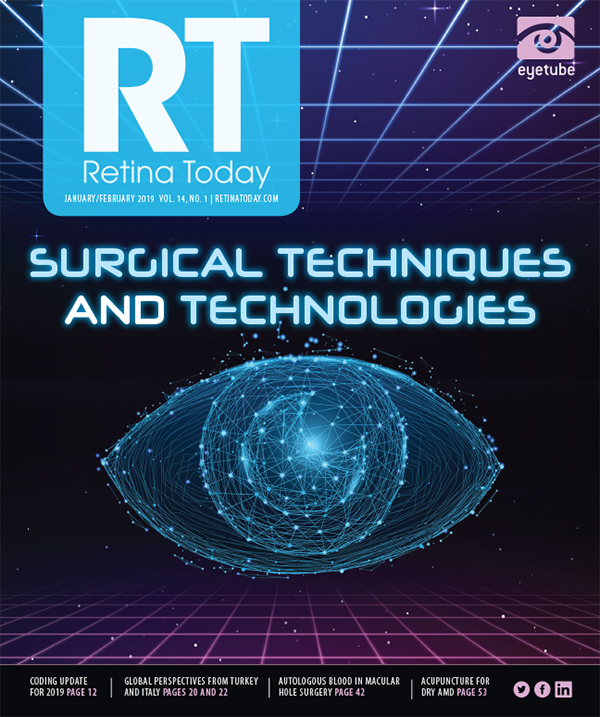 Considering that most international efforts focus on cataracts, which is understandable with the large number of people who need cataract surgery, and that there is a paucity of support for retinal work in general, I was moved to develop Retina Global. Moreover, most outcome studies previously focused on the numbers of cataracts in people and the surgical numbers to correct them. With the increasing prevalence of lifestyle diseases such as diabetes and hypertension in underdeveloped areas around the world, there was a thought that we might end up with an increasing number of people afflicted with and blind as a result of retinal diseases, such as diabetic retinopathy (DR) or macular degeneration. This was another reason behind the development of the organization. On a personal note, I am a coinventor of a medical device that allows people with certain retinal diseases to see again. Having worked on device development, clinical trials, and regulatory approval for more than 8 years, I realized that such a device, although beneficial to a significant number of people, will not be available to most people in the underdeveloped areas of the world. Dr. Reddy: What would you say are the greatest accomplishments of Retina Global to date? Dr. Agrawal: We are a young organization, having come into existence in the past few years. There’s a lot to be achieved, and our first accomplishment has been getting extraordinary and committed specialists to join our board of directors and advisory board. Initially, there was confusion as to what the objectives of the organization should be. Some wanted to focus on bringing trainees to the United States to provide them training at various eye institutions. Having worked in places that are close to these underdeveloped areas, I realized that such an approach carried some risk. Despite receiving excellent training in the United States, trainees who return to their home countries could face major issues, including lack of facilities, lack of access to equipment, and financial hurdles. We therefore decided to take an interventional approach. Our volunteer retina specialists from the United States, Europe, and other places visit these underserved areas for a week at a time on a frequent basis. They provide retina care to patients who have been prescreened by local ophthalmologists, which maximizes the retina specialists’ time. The visiting doctors also work with local ophthalmologists and ophthalmology residents to provide hands-on instruction in disease management. We believe this approach has some advantages. The visiting retina specialists are able to better understand the spectrum of retinal diseases that affect a particular region, and this allows us to focus our resources to provide management of these diseases in that region. In addition, the visiting retina specialists, working with local ophthalmology residents, are able to identify those who are committed and focused on becoming retina specialists. These trainees get to learn from several retina specialists over time, each one bringing a different mindset to managing retinal diseases, similar to a fellowship. Once we identify an individual for advanced training, we sponsor that individual’s fellowship training in retina at an eligible program, with the condition that they then return to their countries or regions to provide retina care to the community. These trained individuals are also tasked with training others in their community, thus creating a sustainable model. All along, we continue to work with the sites we have carefully chosen, providing support, including teleophthalmology consults and services and additional visits if required. We also support the sites with equipment and infrastructure when needed. In all, we commit to each site for 5 years, which is usually the time required for an individual to become reasonably proficient to manage retinal conditions and ready to train others. Figure 1. 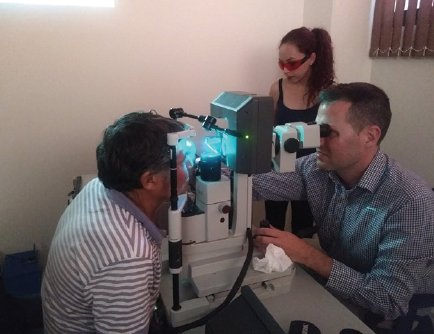 Jesse McCann, MD, PhD, performing laser on a patient in Bolivia. Figure 2. A Retina Global outreach visit to Bolivia. Figure 3. Ashvini K. Reddy, MD, examining a patient in Bolivia. Dr. Reddy: Please describe the BOLDR project. Dr. Agrawal: We were made aware of the increasing prevalence of DR among the Bolivian population. This led to the initiation of the Bolivian Diabetic Retinopathy Project (BOLDR). Although this will be a national project, we started with phase 1 of the project in Cochabamba, one of the largest cities in the country. With support from the World Diabetes Foundation, Ocurion NV, the Allergan Foundation, the Alcon Foundation, and others, we are collaborating with Fundacion Boliviana De Oftalmologia, which is the only residency training institution in Cochabamba. We are supported in this endeavor by the Bolivian Sociedad de Oftalmologia and the Sociedad Boliviana de Retina (Figures 1-3). 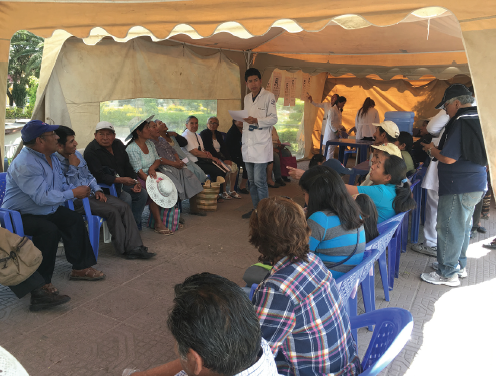 The goal of this initial 3-year project is to develop resources in DR management in Cochabamba, including trained personnel, equipment, and infrastructure, and to expand it to other parts of the country subsequently. 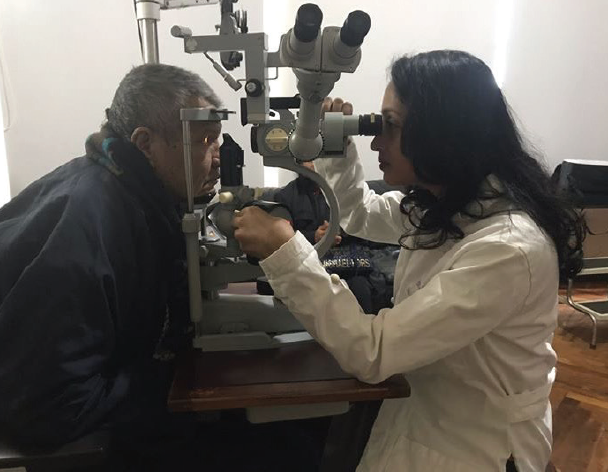 During our mission trips to Cochabamba, we provide free retina care to the people of Cochabamba, while also training ophthalmologists and senior ophthalmology residents in basic retinal disease management. We also conduct certification courses for ophthalmologists and ophthalmology residents on DR and various issues related to diabetes, as well as certification courses for the family and general physicians who are the first points of contact for diabetic patients, to increase their awareness about diabetes, DR, and related issues such as nephropathy and neuropathy. We believe that, at the end of 3 years of this phase 1 project, we will have a fellowship-trained retina specialist who can provide care to local patients while training others in retinal disease management. We are also involved in a study that will define the prevalence of DR in Bolivia. Apart from that, we are creating a registry of patients that will help us perform real-time analysis of disease patterns in the community. In time, we plan to expand the project to other cities in the country. Figure 4. 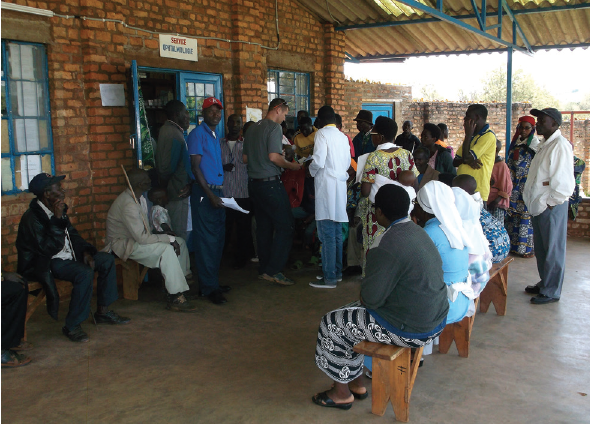 Patients in Burundi waiting outside a clinic. Dr. Reddy: Is Retina Global pursuing other opportunities around the world? If so, where? Dr. Agrawal: Our current focus is in Central America, South America, and Africa. We have projects in Belize and Haiti and plan to expand to other countries in the Americas. In Africa, we started work in Burundi, but, due to political instability in that country, we have not been able to go back (Figure 4). We are involved in serious discussions in Ethiopia, Rwanda, and other African countries. We also plan to expand into Southeast Asia. Dr. Reddy: Please describe how you manage to accomplish so much as a nonprofit. Dr. Agrawal: Retina Global is a lean 501(c)(3), which allows donations from generous individuals and organizations to be tax exempt. To avoid overhead costs and to maximize the benefit of every dollar, we do not have paid staff or even a formal office. Although we have strong support from retina specialists from around the world, we need more people to join this movement. We also need support from industry, both in terms of donations in cash and in kind. We hope that industry will see the benefit of partnering with us so that patients may also benefit. We work with treatment-naïve patients in most cases, and US-trained retina specialists are involved in providing care in most instances. We hope that these two facts, along with our practices of performing repeated interventions and keeping detailed records, will persuade industry of the value of performing exploratory clinical trials in these regions where patients might not otherwise have access to novel therapeutics.